During the last decades of the Roman Republic and continuing into the Roman dictatorship, the Roman government provided welfare in the form of wheat and other grains to people. The dictators, starting with Julius Caesar, provided frumentariae (grain) partly to be popular with the poor. Subsequent dictators tried to limit or end the grain give away, but couldn’t because of political pressure. The government got the grain by forcing provinces to pay tribute with grain. After several generations, the Roman people got accustomed to getting their free grain. Events occurred in the Roman Empire more slowly than today because travel and communication was much slower then. Eventually Romans refused to fight to defend the empire when they could stay home and get free food. The government had to hire mercenaries to fight. Mercenaries would fight for the side that paid the most. Sometimes these fighters would switch sides in the midst of a battle. In 410 Common Era (c.e. ), the Visgoths, one of the German tribes that invaded the Roman Empire seeking land and that the Romans hired as mercenaries, sacked Rome. Thus ended the empire and welfare for Romans. Once begun, how does an empire stop providing welfare before the welfare destroys the empire? If absolute dictators can’t stop welfare, a representative republic like ours has no chance. The Spanish, French, Soviet and British empires all ended mostly because of welfare. Gary Kirkland is a retired teacher, an Atascadero resident, 35-year-old stockholder in the Atascadero Mutual Water Company and president of the San Luis Obispo County Libertarian Party. Retired teacher at a PRIVATE school I trust. Not likely, more a Mike Brown, no government jobs except for mine. This whole thing is just wrong on all levels. It’s historically wrong. 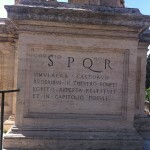 It takes one small slice of roman history and boils it down to one point that surprise! Happens to align with the authors view of the world. I know libertarians stop intellectually progressing when they read Ayn Rand at the age of 19 but this piece is written like a 16 year old who waited until the last second to do his or her ninth grade English paper, and yes this is written like a 16 year old ninth grader. The Romans hired mercenaries, if you define mercenary as a soldier who gets paid, but by that broad definition, and the only one that has any historical relevance we would have to say the same about the US military. Until the end the Roman army was made up of conscripts from far off lands. If you were a conscript in the roman army from Bath you were sent to defend Judea, if you were a soldier from Gaul you were sent to bath. However you were still paid. So you were a mercenary. The author completely ignores the vast majority of an extremely complicated history of the Roman Empire. It is both dishonest and irresponsible! Obviously the author is of very low intellect so I will not hold him any more responsible for this drivel than I would hold a baby responsible for the diaper fill it produces. But Cal Coast news you should ashamed of yourself for putting this out there. Libertarians are to politics what Thomas Kinkaid is or rather was, to fine art. Truly, we are indeed blessed by your mere presence. Nothing like a slew of personal attacks and revelations of personal insecurities to establish a point. I don’t know what else there is to say about Mr. Kirkland’s work. The research is sloppy, and assertions go completely unsupported. As a college graduate and a retired teacher, Mr. Kirkland ought to know that this is unacceptable. As the party leader, he ought to know that it reflects poorly on Libertarianism. Your reply to rOy is appalling. ososKID you need to grow up…..